On Thursday, October 20, the Filipino Student Association (FSA) at UC Santa Cruz held a vigil to honor Filipino Veteranos from World War II by fighting for the benefits that they deserve. Hundreds of thousands of Filipinos served under the United States in World War II, many of them receiving prestigious medals. While promised benefits by U.S. President Roosevelt, the U.S. Government refuses to acknowledge their contributions. Many of these Veteranos have since died, but an estimated 7,000 live in the U.S. and over 30,000 in the Philippines. Thursday's vigil was part of a national day of awareness sponsored by Student Action for Veterans Equity (SAVE). The day was "part of an ongoing campaign to 'paint the nation brown', stressing the awareness of the Brown Ribbon Campaign; an education and action campaign dedicated to the fight for Full Equity only and nothing less, through the passages of H.R. 302 and S. 146"
Wednesday afternoon, anti-war protests spread to the small town of Felton, a Santa Cruz County town of 1500. Protesters promised to hold their vigil every Wednesday afternoon until the end of the war. The protesters meet at the corner of Highway 9 and Graham Hill Road. They held signs and lit candles. Some signs read "Ask the President What He Plans To Do About the War" and "Email the President and Tell Hium to Meet With Cindy." More than a dozen protesters greeted the afternoon stream of commuters returning to the San Lorenzo Valley. Many commuters honked and yelled in support of the protest. "We hope you will give it your serious attention, and we look forward to your reply." 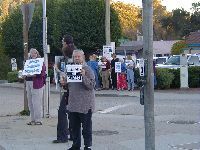 On September 27th, the Santa Cruz City Council voted, UNANIMOUSLY, to resubmit a letter to the House Judiciary Committee of the United Sates Congress calling for the investigation and possible impeachment of all the members of the Bush Administration who have had anything to do with the war in Iraq, the "war on terror," and/or the treatment of the prisoners of those wars. The original letter (.pdf) was sent on September 10th of 2003, but NO ANSWER was ever received! The HJC blew off both the Council and this Community!! In a moment of levity that got many laughs, Council Member Tim Fitzmaurice suggested that, this time, they send the letter "certified, return receipt required" and he would donate the money to do so! Though the action in 2003 was reported world wide, what was not reported was the fact that in the 10 DAYS! following that vote, the council phone lines were jammed all day with calls from all over the country, from folks thanking and congratulating them for standing up and speaking out!! And that was two years ago! The new cover letter, explaining why the Council is resubmitting their original letter, is copied below. Clearly, the evidence supporting the original concerns of this community has increased vastly in these last two years!! And in a recent poll taken after the release of the Downing Street Memos in May, over 47% of the people polled said they thought Bush should be impeached if he had lied about the reasons for invading Iraq. see also: 478 Mayors in CA get appeal to call for the CA National Guard to Come Home Now!!! “A Call to Conscience for the U.S. Congress�? End the War in Iraq! Not Another Death - Not Another Dollar!